Gluten Free Alchemist: Delicious Alchemy have launched a new gluten free BERRY Granola! Yum! Delicious Alchemy have launched a new gluten free BERRY Granola! Yum! Spread the word...... 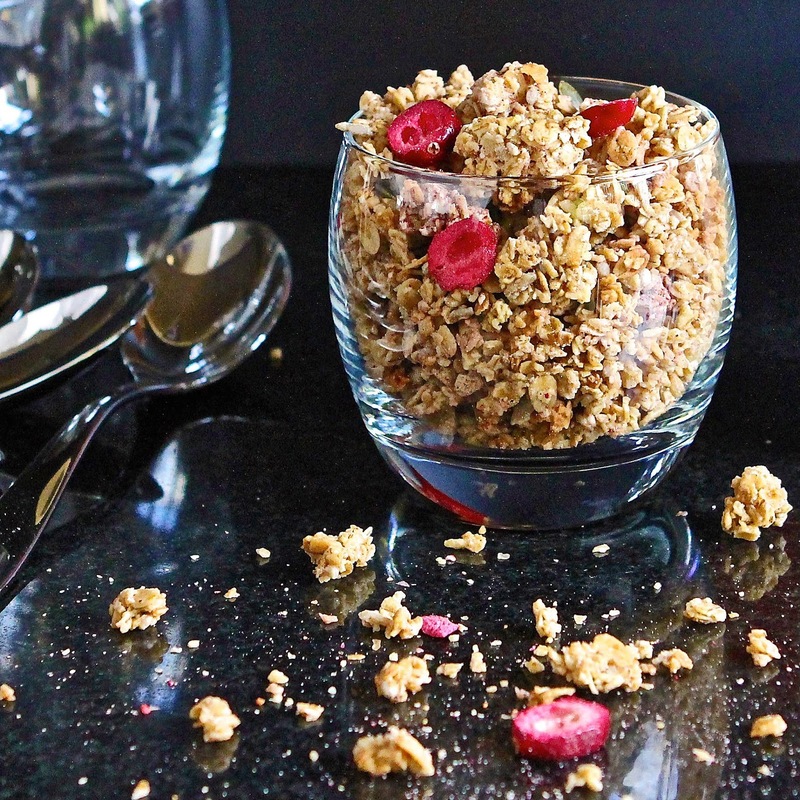 Delicious Alchemy have just launched a new granola......... and it's real good! Made with delicious gluten free oat clusters, it is naturally sweetened with grape juice and honey and is sprinkled with a selection of bright fruity freeze-dried berries (cranberries, strawberries and blueberries) and nutritious sunflower and pumpkin seeds. I have to admit that both myself and Miss GF are very picky about our granola and since being gluten free, it has been really hard to find brands which compare well to those we had when we were still able to eat gluten. So when Delicious Alchemy brought out their Nutty Granola back in the summer, we were really excited. It compared more than favourably to the better gluten versions and we have been firm fans ever since. I appreciate that not all Coeliac sufferers are able to eat oats (even gluten free ones), because a few react to avenin, a protein which is similar to gluten. But if you can eat them, they are a fantastic nutrient source and full of soluble fibre, which supports the maintenance of a healthy gut, as well as helping to treat high cholesterol and keeping blood sugar levels stable. 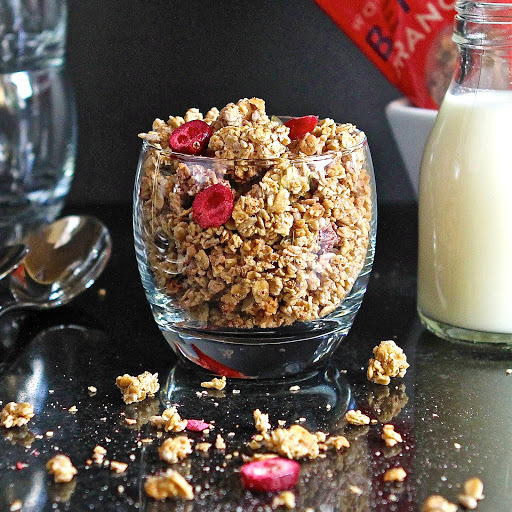 Lucky for us, we can eat them and make sure we include plenty in our diet, whether in baking or smoothies or as breakfast in porridge, or delicious oat granola. This new Wonderfully Berry Granola is the latest addition to Delicious Alchemy's breakfast range and I suspect could be about to challenge the nutty version for space in the larder. Although I think the ratio of berries in the mix could have been a little more generous (I have a huge love of freeze-dried fruit), this is compensated for by the earthy hit of pumpkin and sunflower seeds which add an amazing and unexpected contrast of flavour and texture to the mix. 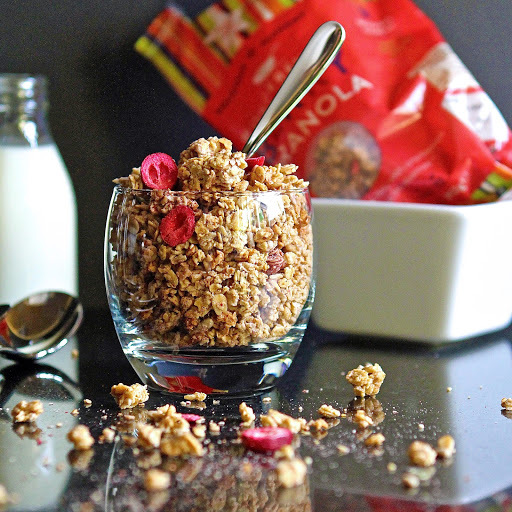 A bowl of this granola is perfect doused with the usually expected milk or yoghurt, but I have also taken to scoffing handfuls 'neat'..... straight out the bag for a quick slow-release energy fix during the day. 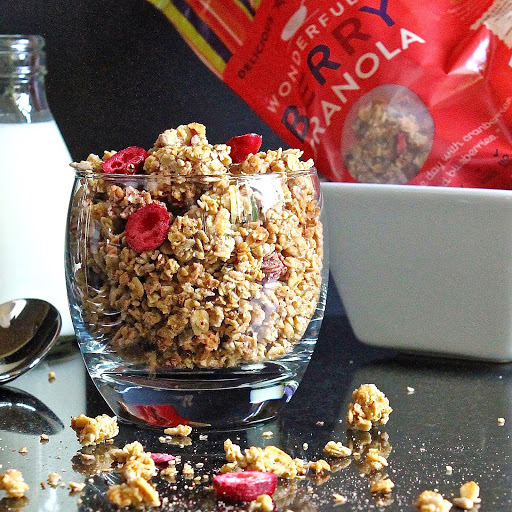 If you are anything like me though, you may also find yourself seeking breakfast on the run on way too many mornings of the week..... Keep a bag of yummy granola in the car and it will not only ensure you don't miss out on the 'most important meal of the day', but will brighten up the worst of rush hour traffic jams. Who cares if you end up with crumbs on the dash board, at least you will be happy with a satisfied tum! However you enjoy it, this bag of goodness is definitely worth a try. You can get it currently on line through the Delicious Alchemy website (retailing at £3.00 for a 312g bag), but I have no doubt that it will be appearing alongside other DA products in the supermarkets very soon. 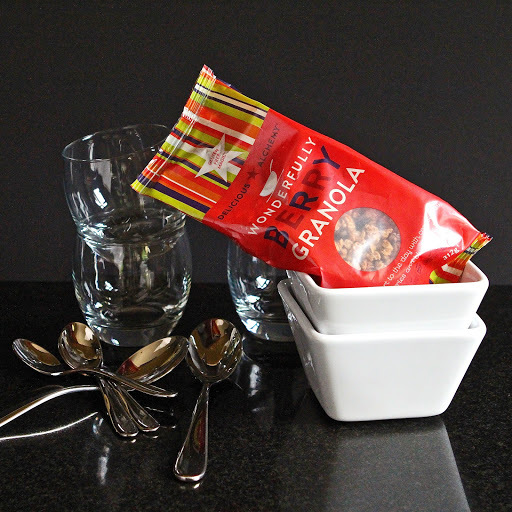 With thanks to Delicious Alchemy for sending me their Wonderfully Berry Granola to try. I was not paid to write the post and as always, all views expressed here are my own. Looks lovely but I make ours. Just made some today, oats, linseed, sunflower and pumpkin seeds, nuts, prunes, sultana's and coconut, coconut oil and honey, ginger, cinnamon and mixed spice! That's great DC...... I've been meaning to make granola for ages. Is your recipe on your blog?